Hi! My name is Mike Frost. I live in Warwickshire, England. For my day job, I am a systems engineer working in the steel industry . In my spare time, I am an astronomer. I chase eclipses and I visit astronomical sites worldwide. 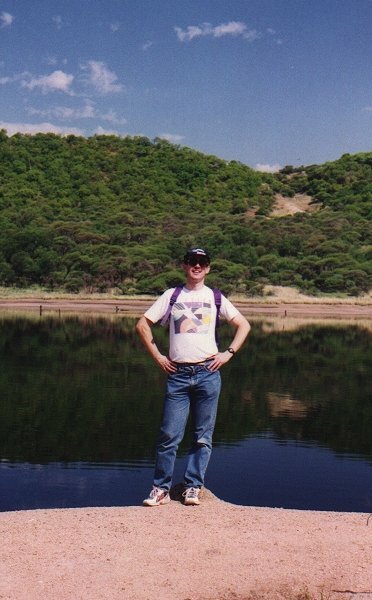 The picture below is of me standing in the Tswaing Meteor Crater, which is 40km north of Pretoria, South Africa. The British Astronomical Association and The Royal Astronomical Society. I also write articles and give talks to societies around the UK (and beyond!). Interested? Email me! Use the email facility at the page end. CfDS - The Commission for Dark Skies. An Anti Light Pollution Organisation.